A scorching July for Franklin Barreto has unfortunately come to a screeching halt. The A's No. 2 prospect was diagnosed with a severe bone bruise in his left wrist -- an injury that will require a splint for three weeks and a trip to Arizona for rehab, according to Class A Advanced Stockton broadcaster Zack Bayrouty. Barreto first suffered the injury on a bouncing ground ball off his left wrist and hasn't played since June 20 while he underwent tests to check the severity of the injury. 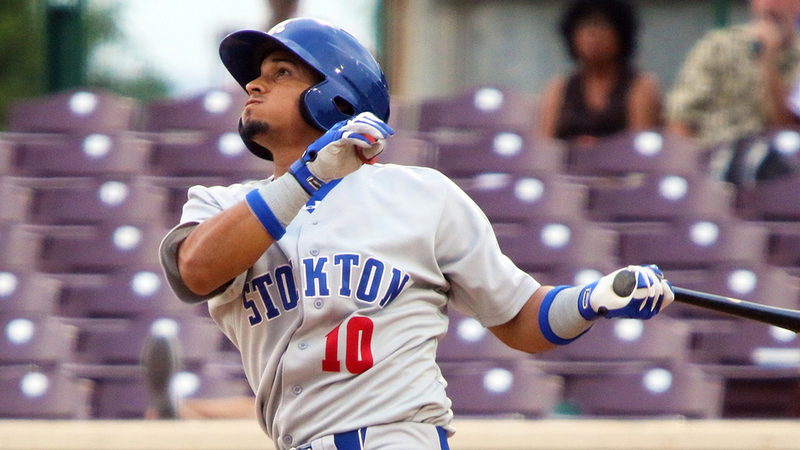 Although no specific timetable was given for the 19-year-old shortstop's return to Stockton, Ports manager Rick Magnante didn't sound too optimistic that it'll happen soon. "Right now, to count on Franklin [to return] in the near future is probably not going to be a realistic thought," Magnante reportedly told Bayrouty. Acquired from the Blue Jays in November in the blockbuster deal that sent third baseman Josh Donaldson from Oakland to Toronto, MLB.com's No. 67 overall prospect was starting to break out during his first season above Class A Short Season ball. In 19 games in July, Barreto had a .375/.393/.700 line with six homers, a triple, six doubles and 14 RBIs. Put another way, he had as many homers in July as he had in April, May and June combined. For the season, he has a .298/.329/.492 line with 12 homers, three triples, 22 doubles and eight steals in 88 games with the Ports. "He's just a young kid with a ton of potential," Ports hitting coach Brian McArn told MiLB.com on July 19. "Playing the game and getting used to high-A, he's finally getting comfortable and learning his swing. His work ethic, he's in the cage working every day and working on his swing in batting practice. I think his confidence is finally getting to where he wants it, and he's just stringing together some good ABs." The Venezuela native jumped onto the prospect last season when he hit .311 with an .865 OPS, six homers and 29 stolen bases as an 18-year-old at short-season Vancouver.